London's Heathrow Airport seems to be the spot if you want to wile away a layover in a luxury airport lounge. The latest comes from an alliance between Delta Air Lines and the Air France KLM group. 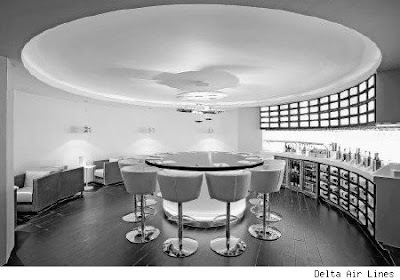 The two-level minimalist styled lounge features a spa, restaurant, wine bar, oxygen bar and entertainment hub. The Atlanta Journal-Constitution also reports that the lounge has an indoor "living wall" made up of over 60 types of plants which is located near various seating areas. Weary travelers can sit in full-body massage chairs, use personal computers, take a shower or grab a nap in a daybed. Heathrow Airport also has a lavish British Airways airport lounge and Virgin's Heathrow clubhouse is more like a resort with a Cowshed spa that includes tanning booths, a Bumble and bumble hair salon, a pool, cinema, cocktail bar and a business center. The airport boasts a variety of restaurants including one by Gordon Ramsay and shopping that includes Burberry, Versace, Hermes and Cartier.